The recent 72nd anniversary of the bombing of Hiroshima went by quietly on American news (in part because there’s just so much news to cover exploding out of our own White House). So, on Aug. 6, I turned to the one place I knew would give the commemoration of the bombing its due coverage: NHK World, Japan’s English-language public television network. NHK World didn’t disappoint. The network aired live the annual solemn ceremony at Hiroshima Peace Memorial Park that included dignitaries including Kazumi Matsui, the mayor of Hiroshima, and Japanese Prime Minister Shinzo Abe. The speeches were translated into English, and the dolorous seriousness of looking back at the horror of atomic war and looking with hope to a future without war were that much more powerful to be able to watch it live. Sure, there are other ways to keep up with news from Japan. I have a digital subscription to JapanTimes.com, the website of the respected English-language newspaper. An aggregator called JapanToday.com compiles news from various sites and is a helpful stop to catch up on the headlines at a glance. The Asahi Shimbun’s English-language website (asahi.com/ajw) is also good. But NHK has been the bridge to Japan for a lot of people in the U.S. My mom watches Japanese-language programming via satellite exclusively, which means she never even tunes in another channel, even though she pays for a full service and the extra to get NHK. If my mom is home, the TV is on, blasting do-rah-ma (dramas, or soap operas), wacky game shows, talk show, music and comedy variety shows, sumo tournaments and even children’s programming. The network also broadcasts news, of course, with its low-key and understated anchors (the game show hosts, on the other hand, seem as if they’ve just downed a gallon of cold-brew coffee before the cameras have been turned on). My mom loves the samurai doramas and pastoral nature shows, but she gets puzzled watching the news. I’ve visited her when the news is on, and she has no idea what many contemporary words that Japanese use mean. Having come to America in the mid-1960s, she never learned more modern terms like pasokon (personal computers) or poppu mujiku (pop music). Even though I have limited Nihongo ability, I can pick out the “katakana words,” as she calls them, and end up telling her what the report is about. Katakana is the alphabet that’s used for foreign words. For years whenever I traveled to other cities, I’d check the hotel TV menu to see if it carried NHK World, the English version of the network my mom watches. I like the headline news presented every half-hour, though I admittedly get a bit tired after several hours of seeing the same news. But I really love the lineup of feature programming, which tends to focus on cultural and travel and tourism topics. I still count on the top headlines every half-hour, and I still get tired of seeing the same stories after a while. But other than that, I like to tune in to a variety of programming that introduces me to areas of Japan I haven’t visited, plus, NHK World teaches me about the country of my heritage. There’s a smart mix of programs that cover both traditional and contemporary culture, from profiles of artisans who’ve mastered an ancient art form or craft such as traditional carpentry, to fun insider looks at today’s colorful fashion industry or shows about anime or J-pop music. “J-Melo,” which describes itself as the only Japanese music program in English, has a worldwide audience, and each episode spotlights viewers and J-pop fans from other countries. There are also shows that place traditional culture in modern context, like “Kabuki Kool.” Some of the channel’s programming it features are Japanese shows dubbed into English; some have English subtitles; and some (like the newscasts) are entirely in English. In between shows, there are often short bits of content that might introduce viewers to a traditional Japanese dish, or teach a few words in a quick language lesson. The website is also worth spending time on, especially if your local cable carrier doesn’t include NHK World. Most of the shows are archived online, and there are helpful categories of shows such as News, Travel & Culture, Food and Learn Japanese. 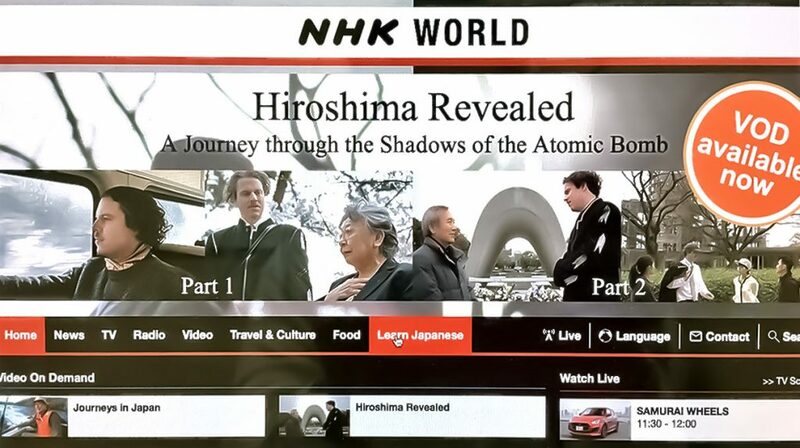 Like many stations, you can also view NHK World in real time streaming at the click of a button. NHK World has introduced me to towns and regions of Japan I wasn’t familiar with that I now want to visit. When they air a documentary about a region like Hokkaido or a city like Beppu, I go to Google Maps and find out where that is, so that I might remember to try and get there sometime. And though I’m not a fanatic and tune in like my mom, NHK World broadcasts highlights during each national sumo tournament. I was surprised to find that I like watching the sport, which I remember from my childhood in Tokyo. When there’s an event like a natural disaster such as typhoons, floods, earthquakes or tsunami, NHK World is my go-to for updated news and information. That’s why I knew it would be covering the 72nd anniversary of the atomic bombing of Hiroshima. Check it out, and I know you’ll feel more deeply connected to Japan than before. Gil Asakawa is chair of the Editorial Board of the Pacific Citizen and the author of “Being Japanese American” (second edition Stone Bridge Press, 2015). He blogs at www.nikkeiview.com.